Snap Fitness contest: Win a gym franchise. Really! A Snap Fitness gym is the grand prize in a contest launched by Snap Fitness franchise owner Peter Taunton. NEW YORK (CNNMoney) -- Vacations. Concert tickets. Shopping sprees. These are typical contest prizes. But a business franchise? That's exactly what's being offered in the summer contest "Partner with Peter." Peter is Peter Taunton, the owner of Snap Fitness, a gym franchise he launched eight years ago and grew into a multimillion-dollar enterprise. Participants in the contest -- which ends Aug. 15 -- will win a new Snap Fitness franchise -- a windfall estimated at $250,000. Taunton said he launched the contest because he wants to find someone to represent his brand well and provide a business opportunity. "This is a way for me to reach out and help someone," he said. He also has found an innovative way to promote his business --something more small business owners are trying. Steve Calderia, president and CEO of the International Franchise Association, said a few companies have used similar promotions to get the word out on their franchises. Given the credit situation and economic uncertainty impacting small business, there is a need to find creative ways to market companies, he said. Still, it could backfire, particularly for the winner. Unlike a vacation, concert tickets or a shopping spree, running a business requires persistence and business savvy. It is important that the "candidate is well-qualified to run the business," said Calderia. Otherwise, it could easily become a failed venture. Ben Lawrence, franchisee-franchisor relationship expert and incoming professor at Cornell University, cautions that franchisees, even contest winners, must prepare for significant financial and emotional investment. "Many franchisees get into these relationships without understanding the commitments that such a relationship involves and follow a dream rather than a sound business plan based on realistic expectations." The challenges associated with the business have done nothing to deter people from entering. Since the contest's launch last month, nearly 1,000 people have entered by submitting 250-word pitches to PeterTaunton.com. One of the contestants is Sgt. Daniel Butts, 29, of Madisonville, Texas. The National Guard veteran is home from serving two tours in Iraq, where he was responsible for 26 soldiers and escorting the transport of $20 million in equipment. He also is a business management student at Sam Houston State University and works full-time as a salesman and delivery driver for the oil field supply company Centex Supply. "I am ready to put in the hard work to succeed," he said. There's also half-marathon runner, Marissa Van Rooy, a hospital sales representative for pharmaceutical information company Lexicomp. The 28-year-old has worked her way up through the company since age 16 and nearly tripled Lexicomp sales in the Bloomington, Ind.-region in just four years. The mother of a five-month-old baby girl said she lacked female business role models as she climbed the ranks. "I want to empower other women." Taunton, 49, has 28 years experience owning and operating big and small box fitness centers. 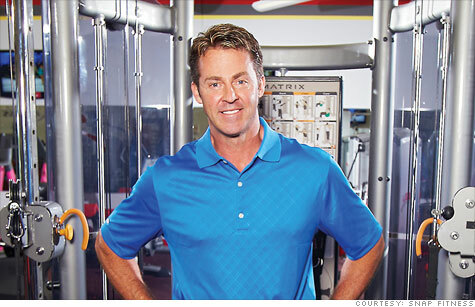 He grew Snap Fitness from a $300,000 personal investment to a $35 million business. The Chanhassen, Minn., chain, now has more than 1,288 fitness franchises across six countries. Snap Fitness gyms focus on cardio and strength-training machines and skip costly amenities like racquetball courts and pools. The franchise's failure rate is 4% and trending lower, said Taunton. In addition to the franchise itself, the prize also includes standard equipment for an average-sized club, security deposit for facility leasing, $20,000 working capital allowance, and, like all new franchisees, training at headquarters, site selection help, and a dedicated account manager. Taunton himself will track the winner, provide assistance as necessary and pick up the $15,000 franchise fee. The winner will have to pay royalties in the amount of $449 a month, plus $75 for advertising and some other similar fees for membership billing, based upon store volume. Taunton and some of his staff will judge entries, looking foremost for motivation and work ethic. Long-time franchise owners will also give input, since, as Taunton puts it, "they have experience first-hand of what it takes to run a successful Snap Fitness." Twenty-five semi-finalists, selected by judges, will have their essays shared online for public vote, "like American Idol," Taunton said. Public opinion will not be the final decision. Instead one-on-one interviews with Taunton will be. The winner will be announced in December, with the franchise opening by spring 2012. Win a year of free rent for your business!